My husband has been riding his bike the 6 miles to work each day. He often needs to carry some paperwork, or his lunch with him and struggled to find a bag that would work well. He didn't want a large backpack to carry for it is way to bulky riding, and he didn't need that much room. I checked with ChicoBag to see what products they had to fit his need. Chico has compact, reusable bags, perfect for the person trying to decrease their carbon footprint. The perfect bag for the need! It has been used by just about every family member. I used it for Vacation Bible School to carry my supplies, my daughter used if for carrying some things to a birthday party, my son used it to card his things around on a short trip. It is very easy to use, the adjustable straps allow any of us to use it. I love that it is made from recycled PET ripstop fabric!! There is even a side pocket that you can safely store a water bottle. I love that when it isn't being used it can fold up nicely into a small pack and be stored. We have some very big, bulky backpacks with wheels on them that are so cumbersome to store. I definitely like the ChicoBag better! ChicoBag is greening up Back to School and offering this Cross Body Messenger bag to one of my readers! 'The Purple Potion Messenger10 rePETe is a sophisticated urban messenger bag, designed to complement the bicycle commuting lifestyle. The Messenger10 features a curvy silhouette, cocooned bottle pockets, a sleek magnetic closure system, two separate internal pockets for added organization and an adjustable strap. When not in use the entire bag stuffs down into the inside pocket for convenient storage under your bike seat. Made of lightweight and durable recycled PET ripstop fabric, the Messenger10 rePETe is 85% recycled content by weight and lists the recycled components used in manufacturing on the inside of the bag. The Messenger combines the utility of a compact reusable bag with the comfort of a designer messenger bag." 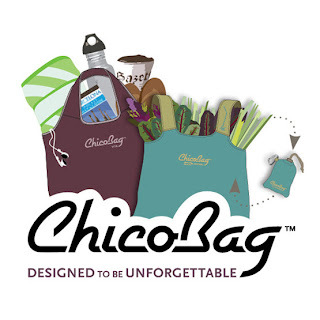 ChicoBag has shopping bags, fashion bags, and even customable bags for your company or school! A bag for every need, and a fantastic company to help green up your bags! I just love ChicoBag's mission statement! "To help humanity kick the single-use bag habit"
"Our mission at ChicoBag is really quite simple - we want to provide best-of-class products and services that result in the significant reduction of single-use bag use. We believe we can best achieve our goal by delivering a wide array of reusable bags that deliver solutions to every lifestyle. Our commitment to the environment is what motivates us to come to work every day and drives us to provide a trusted brand and a portfolio of quality products aimed at helping humanity solve the environmental challenges ahead." ChicoBag is the kind of company I am happy to support! I received a product from Chicobag in exchange for an honest review. I love Chicobag. I have the Vita and use it for a lot of things. I would love to have one of these bags. Thanks for the great giveaway!